Choose Free 8th Grade Science Fair Project or Easy Science Experiment. Darwin Bots and Framsticks - Modeling the Evolution. Chromatography is one of the advanced methods of modern chemistry. The application of this method is very broad. For this project you can either separate mixture of unknown substances or study chemical property of the solvent or stationary phase. Check our example of simple TCL experiment you can setup at home. Phototaxis is the way the living organisms react to the light. It can be positive (moth flying toward the light) or negative (cockroach hiding in the darkness). Moth phototaxis study can be very cool 8th grade science fair project. Obviously this is also good summer science project. How many different moth species live in your area? How light intensity affect the amount of attracted moths? How color of the light affect phototaxis. In other words will red light attract the same amount of moths/species as blue light? What kind of light source attract more moths? Can moth see the black light? Square piece of the white fabric (1m^2). Hypothesis of this project is that moth eyes can see the difference in the light color and certain light color will attract more moths. There are other uncontrollable variables such as temperature and humidity of the air. You'll need to make records of this variables and make several trials of your experiment to get some average data. In fact you could make this variable(s) the main focus of your experiment if your change your hypothesis. Fasten fabric on the wall. Setup the lightsource in front of it so that lightsource illuminate it uniformly. Put the color filter around the light source. Turn the light on after sunset. Count the moths that were attracted by the light early in the morning (ideally - few minutes before sunrise). Try to count how many different moth species light attracted and how many specimens of each species. For better results each morning you can collect them and release in the nearest park or in the garden. You could also try to tag some of them to check if they will return back to your trap. Have you ever heard about evolution simulators? 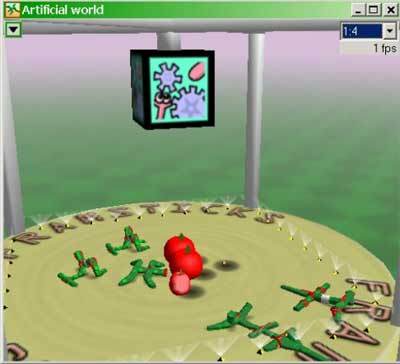 It's a type of computer program that tries to simulate the processes of natural selection that occurring in the real world. Evolution computer models is another example. There are 2 computer programs available free of charge that allow you to run virtual evolution experiments. Both of them allow you to create virtual "environment" with certain features and simple organism(s) that inhabit this environment. Each organism have certain amount of energy and simple DNA to keep its genes. Set of genes can be user-defined or randomly generated. Like in real life genes have complete information about organism body structure and its functionality. If organism successful in its environment it has higher chances to reproduce and pass its genes to the offspring. Like in real life some genes may got mutations and part of the information will be lost or distorted. This mutation may decrease offspring fitness and it will have less chances of survival but there are chances that some mutation will be more successful and it's "owner" will get some bonus features. User sets parameters of the environment, organism energy limits, mutation rate, initial genes (optional) and some other and does not have any influence on the organism features. They develop, like in real life, following principle of "natural selection". Darwin bots look much like colony of single cell organisms under microscope..
And this is Framsticks. Fitness trial. Framsticks interface look more like a screenshot from a computer game. Both programs are looking like a simple computer games but allow you to do pretty cool experiments on the artificial life. All you need for such kind of 8th grade science fair project is computer and a little bit of patience. You'll need to read manuals and learn basics of DNA language (which is different for both programs). Important! Never look directly at Sun! It can damage your eyes. Sun is the center of our solar system. It's G2 class star. This stars also known as yellow dvarves. All planets in our solar system rotating around the Sun and also around their own axis. Earth makes one turn in almost exactly 24 hours. Mars makes one turn in 24 hours, 39min., 35 sec. It's quite happy coincidence for the mars missions that will land on this planet as it should be pretty easy to adopt to this difference. The other planets of our system have very different day duration. For example Venus's day is 243 Earth days! Venus in many respects is Earth's sister planet but this rotation rate and thick atmosphere made it very inhabitable place. Amazingly the day on Venus is longer than year so in the morning Sun rises in the west! Anyways, if all planets are rotating, our Sun must be rotating too. What it's rotation period? How it compare to solar system planets periods? Is there a way to find it out? Yes, because Sun's surface have spots. Check position of the spots on the Sun disc every day and you can measure how fast it rotates. You may decide to build your own Solar Observatory. Never look directly at Sun through a telescope! Or you can use latest data from orbital solar and heliospheric observatory (SOHO). The cool thing about that is that you can get data not only visible light but also taken trough narrow band filters in ultra violet rays. They may reveal much more interesting details of the Sun surface than you can see in visible light. You can also watch and study solar corona (even though it's not directly related to this project). Think of what other science fair projects could be done with this great source of information. What kind of materials can block cellphone connection? any other material you think may block cellphone. Try to wrap cellphone in the foil, wire, other materials and check if you still can call it. What is the most efficient way to block the phone. You may want to participate in some real scientific projects. You can use scientific data available to the public to study the subject of the project and make conclusions.